I've made these spicy little grilled shrimp appetizers several times now and every time someone comments on how the flavors really work well together. 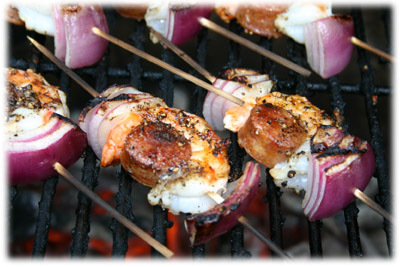 It's as easy as threading red onion, spicy Chorizo sausage and jumbo shrimp on a small skewer, season lightly, grill and enjoy. 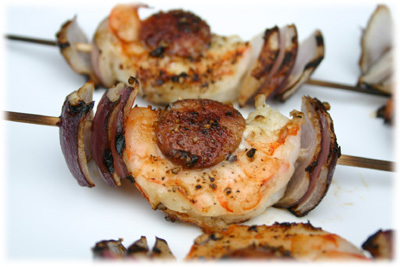 Chorizo sausage and shrimp sound like an odd combination but once you try these spicy little guys you'll be hooked. These are really easy party appetizers for a crowd or just a nice stand alone spicy appetizer for those lazy Sunday afternoons. Tip: soak the skewers in pineapple juice instead of water. Tip: if you can't find chorizo sausage any spicy cooked sausage will do. Oil the grates well and preheat the BBQ to 475F - 500F. Lay out the ingredients on a work surface. Cut the red onion into chunks. Slice the chorizo sausage into 1/2" chunks. Ensure the shrimp is raw, peeled and deveined. Soak the 6" skewers in water (or pineapple juice) for at least a half hour. Thread a small chunk of onion on the skewer first. 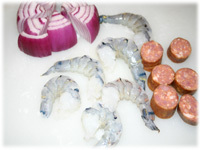 Lay a shrimp on it's side on your work surface and place a piece of chorizo sausage in the curve of the shrimp. 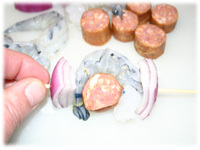 Push the skewer through one side of the shrimp, through the sausage and out the other side of the shrimp. 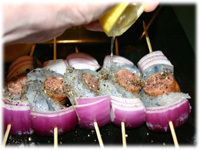 Pick up the skewer and thread another small chunk of red onion on the end to secure the shrimp in place. Preheat the grill to 475F - 500F. Rub a small amount of oil over all sides of the appetizers. Sprinkle freshly cracked pepper over them. Squeeze 1/2 lemon over all the appetizers. 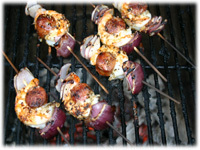 Place the skewers on the preheated grill over direct heat and close the BBQ lid. Let cook for about 2 - 3 minutes. Lift the lid and peek under the shrimp skewers. 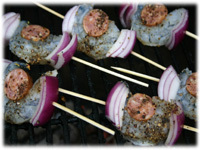 If the shrimp are turning pinky-orange in color and the sausage is grilling nicely then go ahead and flip them over. Close the lid and cook another 2 - 3 minutes. Lift the lid and check the grill side of the appetizers. If these look like they're cooked (sausage is browning and shrimp are orange/red and firm) then they're ready to remove from the grill. These appetizers are as spicy as the sausage you use so if you want them milder try a regular cooked summer sausage instead.